Coun Sarah Day and swimmers John Stuart, Stephen Hooper and Patricia Usher. A fitness offer for the over 60s is being extended after making a splash. More than 1,600 people aged 60 and over have taken up North Tyneside Council’s offer of free swimming on Fridays at its pools since the scheme was launched last September. After being initially funded through Sport England’s Swim Local project, the council has decided to continue the initiative for a further 12 months at Waves in Whitley Bay, Tynemouth Pool, The Lakeside Centre in Killingworth, and Hadrian Leisure Centre in Wallsend. 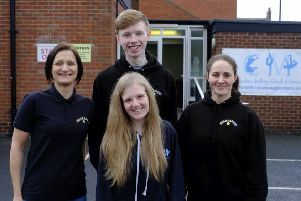 She added: “Swimming is a fantastic pastime and a great way to stay healthy, so we want to give all of our residents the chance to take advantage of North Tyneside’s outstanding facilities. To find out more, visit www.northtyneside.gov.uk or ask at any pool.